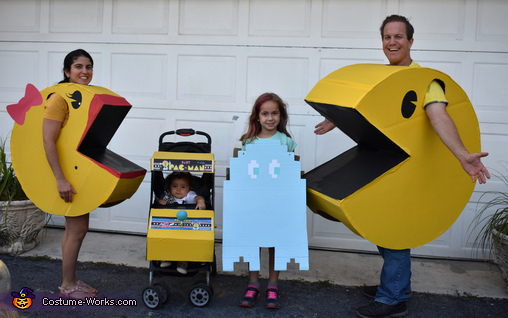 We wanted something fun and classic that all family members could take part of, so Pacman family it was! All costumes were made from large pieces of cardboard taped up to shape and then painted. Instead of spray paint, we used the sample paints at the hardware store. For the details such as eyes, we used whatever color cardstock we needed and glued it on. For the baby Pacman arcade machine, we used templates found on the internet from actual arcade machines and printed them out and then pasted them on. For the joy stick it was just a bolt with a ball at the end. And voila, Pacman family was complete! Cardboard was free and the only cost was the paint; so it was about $20 for entire family.